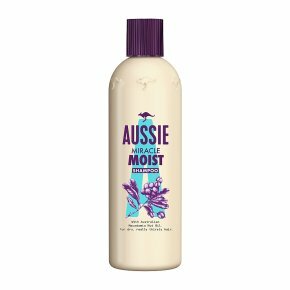 Aussie Shampoo Miracle Moist formula, with "Australian Macadamia Nut Oil", infuses moisture into dry, damaged hair helping to condition and smooth. Native to the land down under, the "Macadamia nut" is rich in oils, and has been used in Australia for centuries. And it would have stayed their little secret if it hadn't been for, an intrepid 19th century explorer who schlepped half way across the world and brought it back for the rest of us. What a guy. Our formula infuses moisture into parched hair leaving it fabulously refreshed. Quench your hair's thirst with our moisture infusing collection. With Australian Macadamia Nut Oil. For dry, really thirsty hair.Quench your hair's thirst with our moisture infusing shampoo, with Australian Macadamia nut oil. Native to the land down under, the Macadamia nut has been used in Australia for centuries for its moisturising properties. But thanks to an intrepid 19th century explorer (who luckily for us didn't get lost in The Outback), the rest of the world was let in on the secret. Cheers dude!